3D shaped case featuring a unique cute bunny. The perfect case for the summer with its right, eye-catching, colourful designs. A great way to show off your unique style while using your smartphone. The case is developed from soft, silica gel and molded into great 3D shapes. 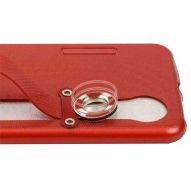 It is quick and easy to fit on your device, just slip inside the smartphone and it's held securely in place. Plus, the chunky rubber is great for protecting the phone when it is dropped or knocked. It allows full access to all the phone's ports, buttons, cameras, switches and chargers.